Building on his eye-opening investigation into the damaging effects of the ultra-competitive culture of youth sports in his first book, Until It Hurts, sports dad and journalist Mark Hyman takes us behind the scenes for a startling look at the business of youth sports - the reasons for rapid changes in what gets bought and sold in this lucrative marketplace, and how these changes are affecting young Americans and distorting and diminishing family life. 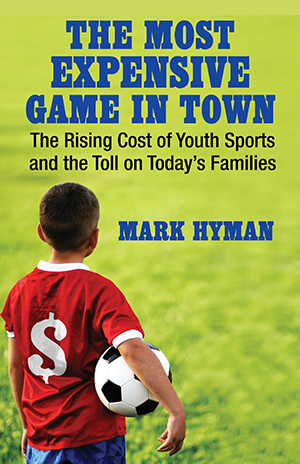 Through extensive interviews and original reporting, Hyman also unearths promising examples of individuals and communities bucking this destructive trend and using youth sports to uplift and enrich kids’ lives, rather than to fill their own pockets. “[Hyman] presents the numbers to prove that most folks who feel that clinics for eight year olds and private coaches for children too young to brush their own teeth are more likely to lead to burnout than to brilliant careers.” —Bill Littlefield, National Public Radio’s “Only a Game”. "Hyman—a recovering sports dad himself - adopts a refreshingly nonjudgmental attitude toward the parents who started out pacing the sidelines and ended up walking off the deep end… with a mix of facts and anecdotes, Hyman pivots to explore the supply side of the equation." "It is widely noted that youth sports have their problems, from the obsession with results to premature specialization. However, economics are at the heart of these problems, and what often gets left unsaid is clearly outlined in Mark Hyman's new book The Most Expensive Game in Town."